	Two double sockets and two ceiling lights. 	An allowance for units, worktops, appliances and tiling. 	Six LED downlights in kitchen and four double sockets in kitchen. 	Two LED downlights and three double sockets in utility. 	Extractor installed in utility. 	An allowance for bath, shower and tiling. 	2 LED downlights and extractor in family bathroom. 	2 LED downlights and extractor in en-suite. 	Four double sockets and Sky TV points. 	Calor Gas underfloor heating throughout. 	Calor Gas boiler with manufacturer's warranty. 	Fully insulated with the latest high spec materials. 	Magnolia walls and white ceilings. 	White gloss skirting and architraves. 	Oak veneered doors throughout. 	Intruder alarm fitted as standard. 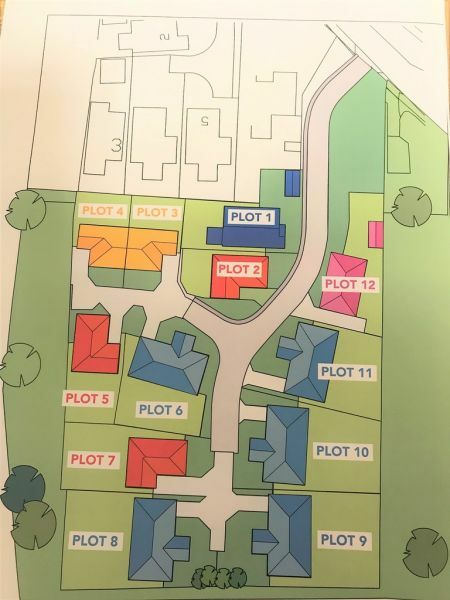 	Paths to the sides and rear of property will be slabbed to meet a patio measuring 2.7m x 2.7m. Slabs used can be upgraded. 	Double glazed white PVC windows to meet building regulations. Windows come with a 2 year service and maintenance guarantee. 	Two security lights to the front and rear. 	Garden fencing (with hedges located where planning specifies to plots 8,9,10 and 11). 	Turf to front and rear. 	Outside tap to rear. There will be no allowance for floor finishing. However, the builders are happy to provide you with a quote.